It’s often said, that it’s young people, especially millennials and generation Z, who need instant gratification, many feedback loops and time-present leadership. In one of our earlier podcasts, we talked with Søren Schultz Hansen, who has studied the digital natives for years. He suggests GPS management to focus on a step at a time and not the end destination. Nevertheless, something indicates that all generations could benefit from this type of leadership. Year after year studies shows, that people are disengaged in their jobs. This indicates that something is wrong with the way we have chosen to organize ourselves as companies. Lack of motivation and employees not being able to use their strengths on daily basis are reasons why people feel disengaged in their jobs. So, how do my mentor make sure I’m engaged in the organizations purpose? Where are you in a year? Six months ago, I chose my colleague who’s at my age, to be my mentor. So, from the perspective of two millennials, how do you engage employees? Start with a dream! Our first 1:1 included a vision board and a lot of post-its (surprise, surprise – we love post-its!). You might think, but how will this motivate the employee to take actions and engaging with the organizations purpose, Arbresh? Well, start backward. Set milestones. The first question Puk asked me at our first 1:1 was “Where are you in a year?” And with a vision board and a lot of post-its, we created a finish line for the next year. Now it was time to create the path to get there. With inspiration from agility – working in sprints – I recommend that managers and employees together set five-day milestones. 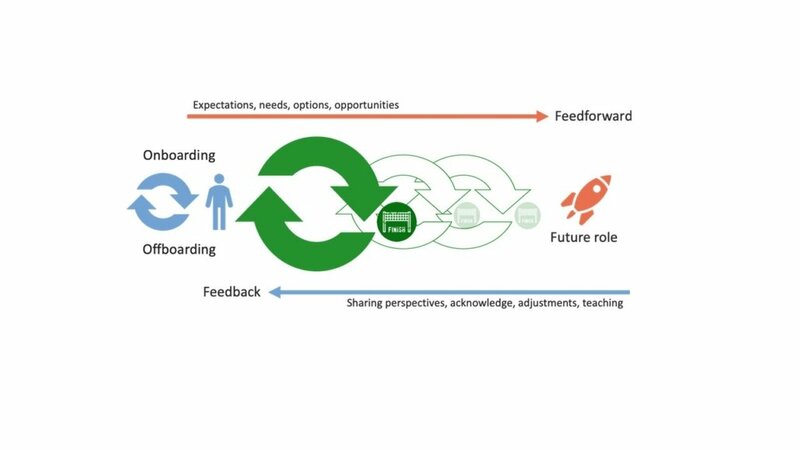 A so-called feedback-feedforward-loop-process. Our experience shows, that the brain can’t handle scheduling and estimating productivity longer than 30 hours at a time, therefore is a five-day milestone beneficial. Shorter and more precise milestones will create a foundation for a sharper vision for the individual employee who, through sprints, gets closer to his/her future role. Once every second month we set goals to be achieved two months in the future. Every week we meet to a 1:1 and plan the next five days – and look at our milestones – to make sure I achieve the two-month goal. Every goal must lead to the vision of where I see myself in a year. The model below illustrates how vision creation can take place between manager and employee through sprints. The whole process is framed in dotted lines, to show that the individual’s five days milestones and two-month goals must fit both the company’s culture and personal life. This way you make sure both the sub goals and the finish goal matches both organizational identity and personal identity. For me it requires flexibility and the opportunity to be creative and innovative because this is how I perform best. Every milestone should lead to a sub goal and have a finish line. In my case it’s two-month goals, and to make sure it matches our organization’s purpose, it must match the question “What have you done to make organizations where people want to show up?”. We never move to the next goal before we have finished the current. Oh, and we always remember to celebrate when we finish a goal at a time. Onboarding can happen again and again – it should not only be a part of hiring but also onboarding on tasks. Make sure you as a leader understands what drives the employee also in their personal life – accept the employee as a whole person. My mentor understands that I’m driven by creative thinking and new ideas all the time. Constantly adjusting between feedforward and feedback. What you expect from your employee should be as clear as acknowledge. This will ensure adjustments. Set only five-days goals at a time and remember to give feedback and acknowledge. Every goal should be created to make sure the employee moves toward the finish line. Don’t underestimate expectations and needs from you as a leader. It should be clear, what’s the organization purpose is. In my case I’m asked how I create organizations where people want to show up. Are you curious about how my mentor made sure I achieved my milestones? In a previous blog post, Puk Falkenberg wrote what her reflection about this was, and how she uses spreadsheets to create milestones to distribute management, making sure to motivate and capture my vision and matching it with the organization’s purpose.